Experience the power of FM Radio and Live Global broadcasts on the internet to reach your business audience! 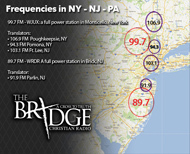 Would you like your message to be heard by thousands throughout the NJ/NY area on the Bridge FM Radio Stations? Or perhaps even thousands more through Live Streaming (with Archived video and podcasts) through the Internet? Now you can reach a large audience of professionals through “Tandem Radio” broadcast live every Saturday from 11:00 AM to Noon (EST). Exclusive ad spots are available for Sponsors who believe in helping business owners with Biblical advice and who would like to reach a powerful audience of people with influence. Our initial Sponsorship Package is not only unique and cost-effective, but will have a positive impact on your marketing plan. Note: Promo slots will be exclusive for approved Sponsors. Reach an influential audience with a powerful message & help spread the Word!